The stamp's central motif is a portrait of Jefferson Davis, designed and line engraved on steel by John Archer, then transferred to a copper plate. The distinguishing incised lines had been ruled as intended guidelines for making transfers. It is estimated that there were 500,000 stamps printed from one hundred-subject copper plate. There is no imprint. Plating is nearly complete with ninety-seven positions identified. These imperforate stamps were printed on soft, porous paper of varying thickness and with colorless gum. The earliest recorded date of use is April 19, 1863. Colors vary from blue to milky blue, dark blue, and greenish blue. The most typical use was to pay the ten-cent letter rate. 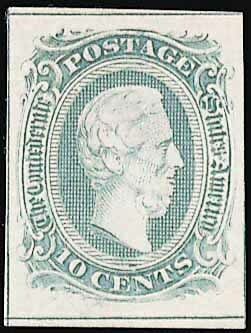 This issue is referred to by students as the Frame Line to distinguish it from the other 10-cent Davis designs, particularly the Type I (Scott 11), which is essentially the same design without the bordering frames. Most stamps only show a small portion of the frame. Stamps showing the entire frame are very rare. Forgeries and facsimiles that show all four frames abound. See the section in the Trouble Spots section of the "Confederate Stamp Primer Online", which deals with differences between CSA 9, 10, 11 and 12 as well as FAKES of Confederate CSA 9 and CSA 10.